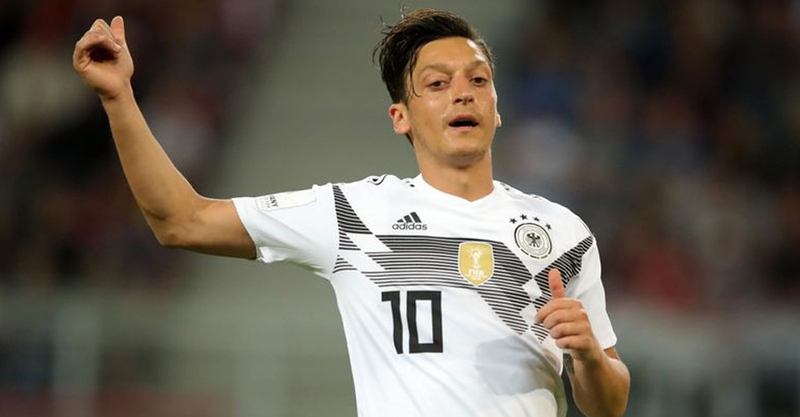 Midfielder Mesut Ozil will miss Germany’s final World Cup warm-up game against Saudi Arabia on Friday so that he can recover from a minor knee injury, manager Oliver Bierhoff said on Thursday. “That knock on the knee is something you don’t want to risk (in a friendly match),” Bierhoff told reporters on the last day of their training camp in northern Italy. The 2014 World Cup winner has also had to deal with a barrage of criticism in Germany after he was pictured with Turkish president Tayyip Erdogan. Ozil, who is of Turkish descent, caused a furore in Germany last month after photos taken in London showed him and Germany teammate Ilkay Gundogan beaming while they presented Erdogan with shirts from their Premier League clubs – Arsenal and Manchester City. The photos unleashed a storm of criticism from lawmakers across Germany’s political spectrum and the football federation, all of whom argued that Erdogan does not sufficiently respect German values. While Gundogan has since said he understood the public’s reaction and both players then met with Germany president Frank-Walter Steinmeier, Ozil has kept silent. He also avoided a media day earlier this week, refusing to talk to reporters at their training camp. “We have done a lot on this issue and it is enough now,” Bierhoff said. “A lot has been said and this issue will accompany us. We had whistles against the player (in last week’s friendly against Austria). Germany are in Group F along with Sweden, South Korea and Mexico in the tournament starting on June 14 in Russia.